I was away this past weekend at a youth retreat sponsored by my church. I had the opportunity to visit with some friends, and I noticed that one friend in particular looked like she had lost some weight. Now, I've seen this same friend once a month or so for several years, but sometimes you don't want to speak up about noticing changes if you're not sure why the change is happening. I figured though, that it's obvious that she's been working on getting healthier, so I asked about it. She went on to tell me that she's lost 60 pounds in the last year, all through the one principle that is the only way to effectively loose weight to get to being fit and healthy for l ife: burn more calories than you eat. Or, some might say eat less, exercise more. 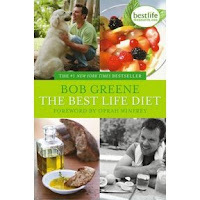 She made lots of changes in her life, and most of them she found through reading Bob Greene's book Best Life Diet. I haven't read this book myself, but I just picked it up from my local library yesterday. I'm interested to see what new thing I can learn from this lifestyle book. She told me her family purchased an eliptical machine, and she started out only able to handle 5 minutes a day on the easiest setting. Now she can go for more than a half hour on the most difficult setting. She is involved in community walks, and feel energy to keep up with all the kids in the youth group. Her husband has lost weight, too, and her college-age children are excited and supportive about their parents' healthier lives. So celebrate with me! It's great when some one finds the tools and the motivation to make positive changes in their lives. Do you have any triumphs to share? Tell us so we can be encouraged by them, too!